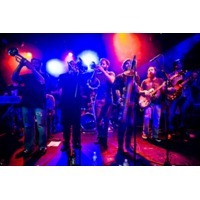 The Budos Band are an instrumental band recording on the Daptone Records label. The band has ten members (up to thirteen members at times) who play instrumental music that is self-described as "Afro-Soul," a term and sound which - in a 2007 interview - baritone saxophone player Jared Tankel elucidates as, being drawn from Ethiopian music the band had been listening to that had a soul undercurrent to it, which the band then "sprinkled a little bit of sweet 60's stuff on top" of. Jazz, deep funk, Afro-beat, and soul influences can be heard in the Budos Band recordings, all of which were recorded at Daptone Records at the label's own studio, Daptone's House of Soul, in Bushwick, Brooklyn.